On April 17, Dutch foreign minister Frans Timmermans held a Town Hall meeting at Maastricht University to discuss Dutch human rights policy. The event, attended by students and stakeholders, was also a last public consultation by the minister prior to presenting his new policy paper. 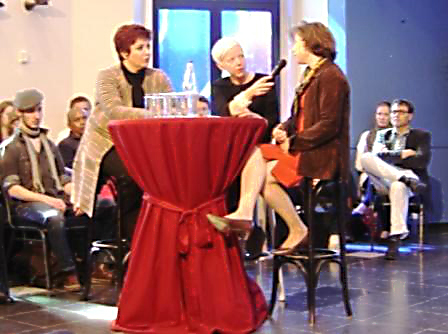 On the recommendation of Hivos, two powerful Syrian women human rights defenders were invited as guest speakers. Mouna Ghanem, co-initiator of the Syrian Women’s Forum for Peace to promote the idea of non-violence as a means to achieve political change in Syria. And Bassma Kodmani, an academic and former member of the Executive Bureau of the Syrian National Council. She is the Executive Director of the Arab Reform Initiative. During a brief introduction, professor of International Law Menno Kamminga stressed that the Netherlands should re-position human rights as a spearhead of its foreign policy and regain its place at the forefront of building and implementing human rights mechanisms. The director of Dutch organisation and Hivos partner COC also contributed with a speech on LGBTI issues, focusing on Eastern Europe. Hivos partners Mouna Ghanem and Bassma Kodmani discussed the role and position of women in the Middle East, and especially in Syria. They emphasised that women are powerful agents of change and their participation in all segments of society should be strongly supported by the Netherlands. Women can reappear in the public sphere if, for example, humanitarian aid is channelled through them. Then they are no longer just ‘victims’, but have a foundation to build upon. Bassma Kodmani stressed the importance of another issue that deserves the Netherlands’ support: documenting human rights violations. Time is of the essence, she said, because without proper documentation there can be no serious (international) prosecution of war crimes perpetrators during a period of transitional justice. Mouna Ghanem concluded that it is crucial for a critical mass of Syrian women to have the capacity and possibility to fully participate in society. In his speech, foreign minister Timmermans underlined that human rights are a priority in the foreign policy of the Netherlands. The various forms of assistance provided by the Netherlands are meant to support courageous people working towards change within their own society: “If we want human rights for ourselves, we must also stand up for the rights of others,“ he said. Timmermans noted that countries where human rights are a problem also have political and economic problems.“You cannot build a sustainable society without human rights, rule of law and democracy. Just look at the Arab world today,” he said, pointing to the fact that despite greater freedom and elections, political forces in the majority are still attempting to restrict people’s rights. This is especially a problem for women and minorities, he added. In conclusion, Timmermans cautioned that the Arab Awakening can be a dream come true if women occupy their rightful position in society and politics, but risks becoming a nightmare if women are excluded for cultural or religious motivations.